Does the new US president alter VR’s calling? Or require full strength escapism? Days after Donald Trump's election, I stumbled upon an article proclaiming that devastated Americans were retreating into a virtual reality app, to live in a socially progressive, utopian world where democrat Bernie Sanders was the president. Of course, it was satire rather than "FAKE NEWS," but was the premise of this fun-poking parody really that outlandish? With VR experiences at this year's CES expo increasingly immersive, designed with the intention of fooling our real world notions of sight, sound and touch, why couldn't this channel change happen? If not now, perhaps a few years from now? Given the chance, how many of us would switch our increasingly dystopian reality for a more soothing simulation? A virtual reality, sure, but also an alternate one. "What makes it less real?" asks Aron Hjartarson, executive creative director at Framestore Studios, LA in an interview with Wareable. "People have already started questioning reality given recent events." It begs the question, where does VR fit in the Age of Trump? Is its role suddenly more crucial in the context of a president hell bent on minimising art and science or do we now have all the more reason to seek escapism? Let's explore the possibilities. One of VR's greatest callings is its perceived ability to foster empathy. It's a theory played out by Stanford University Empathy At Scale project, which proves, among other things, we're more likely to help a colour-blind person when VR helps us see what they see. Likewise, a United Nations VR documentary called Clouds over Sidra gave us a first-person look at the life of a 12-year-old Syrian refugee. After a screening, it brought in 70% more in donations than hoped. In a TED talk the film's producer Chris Milk said VR "connects humans to other humans in a profound way I've never before seen in any other form of media, and it can change people's perception of each other." There are, of course, ways to access more Trump than is available in real life. Should you want to. 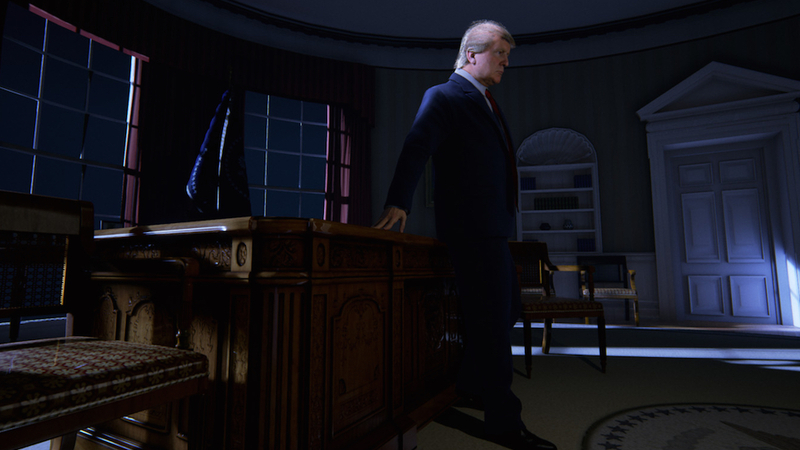 A free app for Vive, the creators of Wide Awake (pictured above) scanned a Trump body double for this recreation which puts the viewer inside the Oval Office. It will be shown as part of an Art in VR exhibition this June in NYC. This awesome 3D Tilt Brush creation, again made in Vive, Hillary Clinton vs Donald Trump: Presidential Election was made pre-election by artist 3Dominus. Impressive but maybe not quite so funny anymore? USA Today livestreamed the whole event in 360 and there's plenty of crowd 360 degree video of the day too. Time's short VR clip (in 4K) from behind the podium gives you Trump's view of his crowds, though. At a time when nationalism is on the rise, when borders are becoming physical and divisions of race and religion are deepening, VR has been championed as the tool that keeps us looking outside our own experiences and belief systems. "It makes the experiences of far away more vivid," says Peter Feld, director of research at digital agency The Insurrection. "Right now people are aghast about how nationalism is on the rise, but people hope VR can be a tool that can fight phobia and a lot of the exclusionary thrust you see with Trump right now." Aron Hjartarson, who led the creation of LUMEN, a meditative VR experience, designed to illicit calming feelings, thinks the VR medium is without equal. "Any well-told story can inspire empathy by putting us in other people's shoes," he says. "However, if you put all the mediums on a level playing field, VR has a great advantage. We commandeer your vision and your hearing and we can directly transmit the message to you. There's nothing else that gives you that complete immersion." Will VR pop the filter bubble or reinforce it? While there's a hope that the expansion of VR experiences could help us identify with others on a more affecting level, there's also a danger of the opposite, according to The Insurrection's Peter Feld. Rather than transport us to a new world, VR could entrench us further within our own. Social media already enables us to converse only with people who share our viewpoints. We consume personalised news and entertainment that fits our agenda. It's so easy to shut out, unfollow or unfriend dissenting sources that it's already argued we have formed our own virtual realities. Would the social VR trumpeted by Mark Zuckerberg, where greater immersion gives us literal blinkers really be any different? "We're looking at increased polarisation and people could easily use VR to separate," Feld says. "There's a complaint that new media enables people to live in a filter bubble. I think there's a good chance VR will accelerate that and give people new tools to retreat into different realities." On the flip side, VR has the potential to mobilise people, both socially and politically. It could become an important medium in the resistance movement against the Trump Administration's policies. "Historically, any resistance movement has taken advantage of whatever tools that are out there," says Peter Feld. "When VR social tools mature, they're going to create a lot of opportunity for activists to connect in ways that can help resist Trump." To bring this back to the Orange tinged and slightly unhinged one, Trump's wants to cut NASA's Earth Sciences budget by $102 million as well as its funding for Education initiatives. The Environmental Protection Agency, The National Institutes of Health, The National Endowment for the Arts and the National Endowment for the Humanities are all facing cuts. Do you see a pattern here? It's anti-science, anti-arts and anti-intellectualism on a grand scale. But VR is here to help, says Aron Hjartarson. "Everyone who has a mandate to pursue science and knowledge and is under pressure from the current administration can use the medium to raise public awareness about what's actually happening," he told us. "VR makes really complex information easier to understand. By combining data with audio, depth perception, spatial audio and immersion, complex patterns that are hard to recognize on a TV are much easier to process. We've been working on the fringes towards combining in this stuff, but there's tremendous possibility once it's all tied together." Hjartarson, who worked in visual effects on films like Tyrannosaur before heading Framestore's VR efforts, helped bring the Smithsonian Museum in Washington to anyone in America with a Cardboard headset. A number of the world's most renowned symphony orchestras are bringing performances to VR. NASA can put you on board the International Space Station. VR is already the resistance. It's an old metaphor, but whenever I consider this subject I always come back to the Red Dwarf episode called Back to Reality. The crew is tricked into believing they've been playing a total immersion video game called Red Dwarf. In the story, they entered the game as a means of escaping from the lives they hated. At some point we have to come back to reality, right? Contrarily, the choice offered to Neo in The Matrix was: "You take the blue pill, the story ends. You wake up in your bed and believe whatever you want to believe." Will VR eventually give us the same choice? And will some of us slap on the headset and simply withdraw? "Of course it may happen," says Aron Hjartarson. "In troubling times, alcohol consumption goes up. People are always looking for escape from something, so it's totally likely that will be the case for some people. "But I think it's going to help, not hurt. I hope people don't use it as a means to retreat from continuing to discover the truth of the universe around us. VR can only help us with the big questions." Given Elon Musk rates the chance we're not already living in a simulation as "nil," we'd be inclined to take that offer of a utopian alternate reality if offered the chance to escape the Donald.